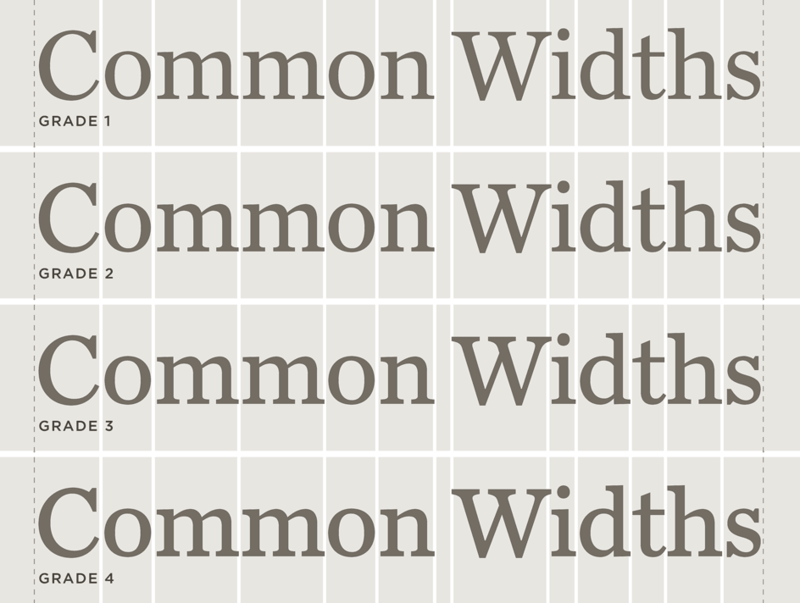 Chronicle Text Font Features: Grades | Hoefler & Co. Designed for newspapers, where ink meets paper in unpredictable ways, Chronicle Text has been developed in four different “grades” to allow designers total control over their media — whatever that media may be. A typeface designed for text needs to account for the paper on which it’s printed. When we developed our Mercury Text family for the New Times newspaper chain, we discovered that the paper’s eleven regional editions printed differently: presses in Miami behaved differently from those in Phoenix, owing to variations not only in stock, but in climate. We applied these lessons to Chronicle Text as well, and created the family in four different grades, versions which are progressively more robust to accommodate different degrees of ink squeeze on press. We designed all four grades of Chronicle Text using the same set of character widths, so designers prototyping with one font can switch grades later without affecting copyfit. This ability to swap out fonts not only gives designers real flexibility in responding to press tests, but it allows publications that use Chronicle’s different grades to share the same content. 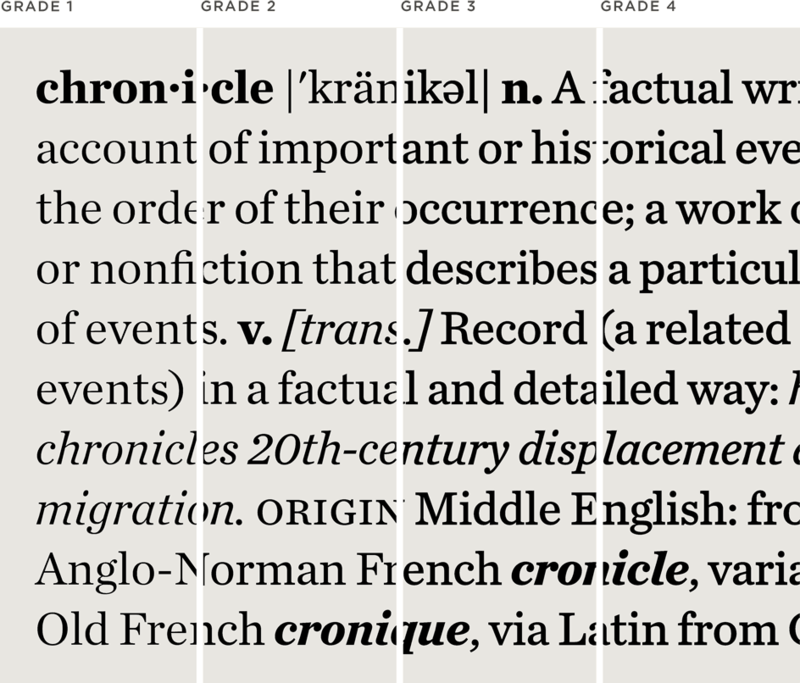 And for designers looking to refresh an existing format, Chronicle’s grades offer a range of typographic colors to choose from — a perfect way to appease readers (and editors) who are accustomed to the daintiness of Century Expanded, the heft of Imperial, or anything in between. Learn more about Mastering Grades. Get all four grades of Chronicle Text for less than the cost of two! Grades. Because type reacts to paper, Chronicle has been produced in four different “grades” to give designers total control over their media. Efficiency. With the hardscrabble environment of the newspaper column in mind, Chronicle has been designed to be as space-efficient as possible. Range. Chronicle’s family tree was carefully planned with actual editorial uses in mind, uses which helped shape the design of its italics, small caps, and boldface. Numerics. For tables and charts, each of Chronicle’s styles offers a companion “Numeric” range that contains tabular figures and fractions. Symbols. Chronicle contains a wealth of special characters, from directional arrows and pointing fists to ballot boxes and suits of cards. Language Support. Chronicle Text features our Latin-X™ character set, covering more than 140 languages throughout the world — including all of Central Europe.